Just a few days ago, Israeli activist Jeff Halper was detained by police in the West Bank. He was taken away by police while he was in the middle of leading a tour of the illegal colony Ma’ale Adumim, and was questioned for possessing BDS materials. BDS is the boycott divestment and sanctions movement, a non-violent movement, demanding that Israel uphold international law. The Israeli state has passed two laws specifically against BDS movement. One piece of the legislation is from 2011, which allows companies to sue BDS activists for compensation, for damage caused to them by the BDS boycott. So far, no Israeli company has made use of this law. The second law is a very new law banning BDS supporters from entering Israel. It does not apply, however, to Israeli citizens. Nevertheless, Israeli police officers detained Jeff Halper citing BDS as the reason. This is not surprising given the way in which Israeli officials speak about the BDS ban. Let’s hear the Israeli Minister for Intelligence Affairs. And his name is Yisrael Katz, speaking about BDS at a conference last year. SHARMINI PERIES: You could see why they may be confused about the application of the laws given the way officials are talking about it. Now joining me to discuss what happened to him is Jeff Halper. Jeff is Co-founder and Director of the Israeli Committee Against House Demolitions. He’s the author of four books; the most recent among them is “War Against the People.” In 2006 Dr. Halper was nominated for the Nobel Peace Prize. Dr. Halper, I thank you for joining us today. 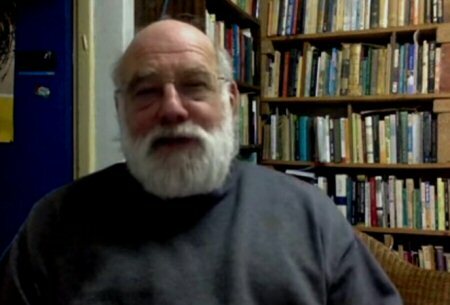 JEFF HALPER: Thanks for having me on. SHARMINI PERIES: So, Dr. Halper, tell us about the kind of tour you were conducting and what actually happened when they pulled you away and detained you. JEFF HALPER: Well, you know, as the head of the Israel Committee Against House Demolitions, I give tours to groups that come to the country; activist groups, diplomats, journalists. We’re very active in terms of trying to show people the lay of the land. We claim that you don’t really understand the political situation here. And, especially how Israel is making the occupation permanent. It’s intentions of controlling the entire country forever, unless you really look at the details of exactly how Israel has planned its settlements — even the word settlement is misleading because it sounds like a couple of shacks on the hilltop –whereas, in fact, a settlement like Ma’ale Adumim, where I was with the group, is 40,000 people. With highways, and infrastructures, and located in a way that fragments Palestinian territory. So that it’s very important that we take groups out there and we take members of Congress, for example, in order to show them exactly the way the occupation is constructed. And, I was out there, like I am often, at a certain point where you kind of see Jerusalem in the distance, from Ma’ale Adumim, and I think what happened, I’m not sure, I think what happened is we take groups there all the time and the neighbors around probably had heard us talking. They probably seen a couple of BDS signs. For example, I was holding up a sign like this, which is pretty BDS-y. And someone, I guess, called the police. Now, in a normal democratic society the police would say, “Well, thank you for calling, but, you know, people can talk in the street,” but not here. And in Israel the police came, detained me, put me in the paddy wagon, and said something about BDS. They didn’t tell me why they detained me. Took on all my maps, all my materials, photographed everything, and then they let me go. SHARMINI PERIES: How did they even know that you had such material on you? JEFF HALPER: Well, I think because, you know, we’re known in Ma’ale Adumim and in that area because we bring three or four groups a week to tour. And that’s a place we normally come. So, I have a feeling the neighbors sort of know who we are. They probably heard us talk a little bit and maybe they’ve seen our maps. They get an understanding after a while of what we’re saying, which isn’t very complimentary towards Ma’ale Adumim, of course. You know, Israelis don’t know much about anything. It has to do with occupation or Palestinians or the left. So, for them BDS is sort of like the cover term you use. So, they probably called the police and they just said BDS. SHARMINI PERIES: And, what did the police sound like? Did they know what the law was and what the material they were exactly searching for? And about the BDS, why did they detain you? How did they explain it? JEFF HALPER: Well, they didn’t explain it actually. It was only when Haaretz did a story about it, Haaretz Newspaper that they contacted the police. And the police told them that I was detained for incitement, that’s what it was. It wasn’t so much BDS per se. I mean it’s illegal yet. Yisrael Katz, by the way, who you quote, this Minister of Intelligence in Israel, has talked about eliminating BDS supporters. I mean, there’s real threats, it’s not some joke. We’re not there yet, but I think the overall charge they could kind of pin on me was incitement for some reason. I mean it was all a joke. I knew they weren’t going to follow it up, but nevertheless, it’s scary. The idea that they are pulling people in for what they’re saying on the street. SHARMINI PERIES: Right. Jeff, ever since the Israel invasion of Gaza in 2014, there has been a real crack down on freedom of speech in Israel. Palestinian poet, for example, Dareen Tatour, was arrested for a poem she posted on Facebook. People lost their jobs for expressing sympathy towards Palestinian victims of Israel violence during that 2014 attack, and then it continues today. Is this the first time you’ve been targeted in this way? JEFF HALPER: No, I’ve been arrested and detained innumerable times, it kind of goes with the turf here. I mean, it is the first time, I have to say, that I was detained for something I’ve said, rather than something I actually did in a protest or resistance or something. And that is a scary thing and the country is closing down. I think Israel’s in the process of kind of mopping up. It feels, especially in the era of Trump, that it can really complete this enterprise of nailing down apartheid. Ending this whole thing. And part of it is, of course, ending all kinds of dissent. So, they feel entitled to act this way, I think, because they feel that they have the backing of Trump and Congress. And that’s all Israel seems to need. SHARMINI PERIES: Right. As far as you understand from the general public in Israel, how are they receiving these laws about detaining and deporting, in some cases, people entering Israel who are supporters of BDS and the application of this other law, how is it being received? JEFF HALPER: Well, on the one hand, it’s received very well. I mean, Israeli’s are very much against BDS. And like I said before I’m not kidding, Israelis don’t know anything when it comes to these kinds of issues. They don’t go to the occupied territories, they don’t think about it. I have to say it’s hard to convey this but everything we talk about; occupation, Palestinians, war, peace and so on, human rights, are completely non- issues in Israel. It’s almost as if we’re living in Nebraska, you know, they’re non-issues. In the last election there was a survey of what’s on the minds of the Israeli voter? What are they voting for? All this stuff occupation was number 11. So, from their point of view all this is really kind of nonsense, we’re a bunch of kooks. BDS is simply a fight against anti-Semitism. I think the BDS, a ban in a sense, has really impacted the American Jewish community much more than Israelis. Israelis don’t care who comes in, or who doesn’t come in, they really are disconnected. They wash their hands of this whole thing. But I think for American Jews, most of whom are liberal, and for human rights still mean something, and critical of Israel, whether openly or not, the whole idea of this kind of a ban and shutting up the voices of dissenters and so on, I think has really affected them. You know, more than 100 Jewish academics in the United States signed a letter saying they’re not going to come to Israel until this ban on BDS is rescinded. So, I think, in a way, it’s having much more of a corrosive effect on support for Israel abroad, especially in the Jewish community, than it is here in Israel where it’s kind of a non-issue. SHARMINI PERIES: Right, Jeff, I want to thank you so much for joining us today and explaining what happened to you. Our time is up. So, thank you so much for joining us.